Sometimes simplicity goes a long way, and this is certainly the case with Just Tyres. Offering unparalleled service that is solely dedicated to tyres - for your car, 4x4 or van - look no further for expert know-how on what your vehicle needs. As Just Tyres is an independent supplier, the team has the luxury of being able to offer a completely unbiased opinion on which tyres, brand and price range you should go for. With a help section brimming with information on tyre safety checks, services and more - it’s clear that with Just Tyres, you’re on board with one savvy tyre supplier. Keeping both your car and budgetary needs in mind, the excellence at Just Tyres stretches further than you may think. You’ll only find quality tyres on offer here, with the likes of Dunlop, Michelin, Pirelli and more brands available in the Premium & Super Premium band. With a Super Value range available still, as well as a Mid Range band that includes plenty of reliable European and Japanese tyre brands - come summer or winter - with Just Tyres you’ll find a comprehensive guide and service to help keep your on road experience as fuss free and safe as possible. Don’t wait to get a quote today and you’re sure to reap the benefits and save some pennies on your tyres with these chaps. How do I use my Just Tyres discount voucher? Click ‘Apply Discount’ and complete your payment. Alternatively, book an appointment or simply go to your fitting centre and be sure to quote the discount voucher you’d like to use. 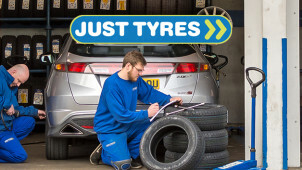 For all the tyre advice you’ll need, scot-free, plus tonnes of promos and more, sign up to the monthly Just Tyres newsletter. Where is my local Just Tyres? Find your local centre from the 36 nationwide stations using the online Find a Fitter tool. Does Just Tyres provide a warranty? You can have complete confidence when buying your tyres, especially when Just Tyres offers a 5 year warranty extension against manufacturing defects on all tyres. Do I have to book an appointment at Just Tyres? You can simply turn up to a Just Tyre centre during opening hours, but you may of course book in beforehand should you prefer to see them at a particular time. Choose a fitting centre to have your tyres delivered and fitted there, while you can also tick for delivery only at the checkout. By finding your nearest centre using your postcode online, you’ll be able to access the Just Tyres opening hours too. Call Just Tyres on 0333 220 5071, email customerservices@justtyres.com or use the live chat. For expert knowledge and service on those all-important tyres, you can look to Just Tyres. It’s in the name, Just Tyres has one focus only and that’s on tyres. Forget getting roped into getting your brakes looked at, or booking your MOT early, a Just Tyres discount code will let you save on what you visited them for - quality tyres. With plenty of reliable brands to choose from, and a local price match guarantee in place too, Just Tyres always has your road safety and your budget in mind. Just Tyres is customer focused every step of the way and wants to keep you in the know on everything tyre related that could help you have a smoother ride. From how to check the tread depth of your tyres to why to avoid used tyres at all costs - check out the plentiful News section to ensure that your road safety is on point and to get more from your car in all seasons. Shopping your All Season Tyres from Just Tyres is a sure-fire way to ensure that your car will soundly get through each year, no matter what the weather conditions may be. Find the perfect model for you by using the refine and filter tool online, and with a Just Tyres promo code you’ll be able to save on a premium brand or even on a cheaper alternative. With no compromise on quality, rest assured that you and your vehicle are in safe hands here.